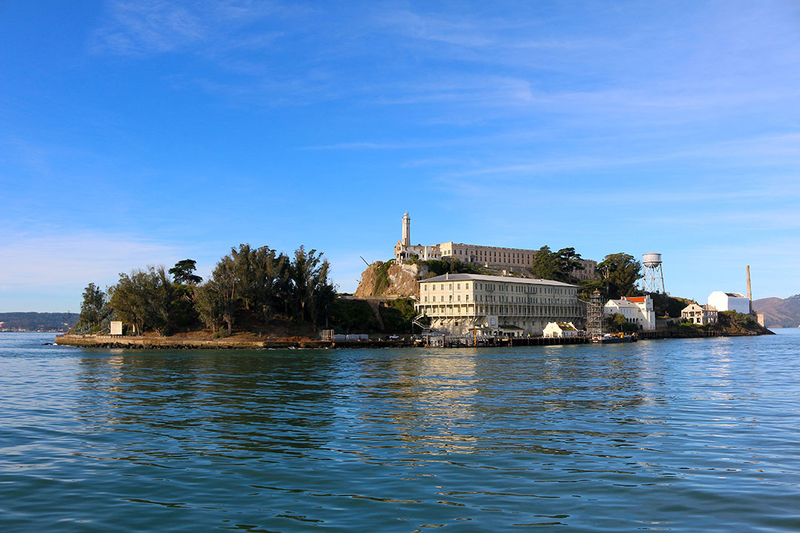 Starting in San Francisco, I planned to visit the usual hot spots like Alcatraz Island, the Painted Ladies, crooked Lombard Street, and the Golden Gate Bridge. I decided to walk everywhere as my 40min airport transfer with SuperShuttle turned into a 2hr sightseeing tour of the city. Not really, but I was the very last drop off, and therefore we drove around the city a hundred times first. I actually felt lucky to have this “tour” as I got to see everything lit up at night and drove up the ridiculously steep streets of San Francisco. After all this driving, it was definitely time to do some walking; about 10km actually! 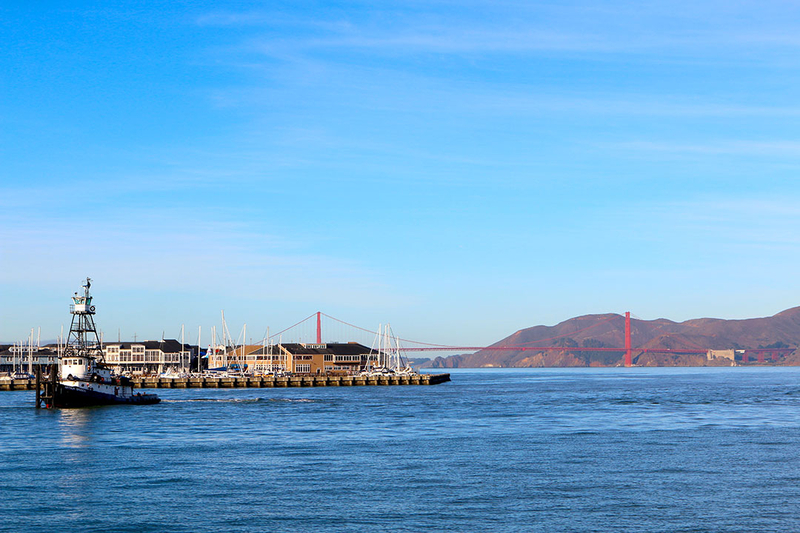 Starting with an early morning walk from my hotel in Union Square to Fisherman’s Wharf, I boarded the Alcatraz Island Ferry at Pier 33 and got a pretty view of the Golden Gate Bridge. Alcatraz was surprisingly good. Although I’d heard great reviews, this sort of attraction isn’t really my thing. But the audio tour (included) is fantastic, as it explains the history and is partly narrated by previous inmates and guards. 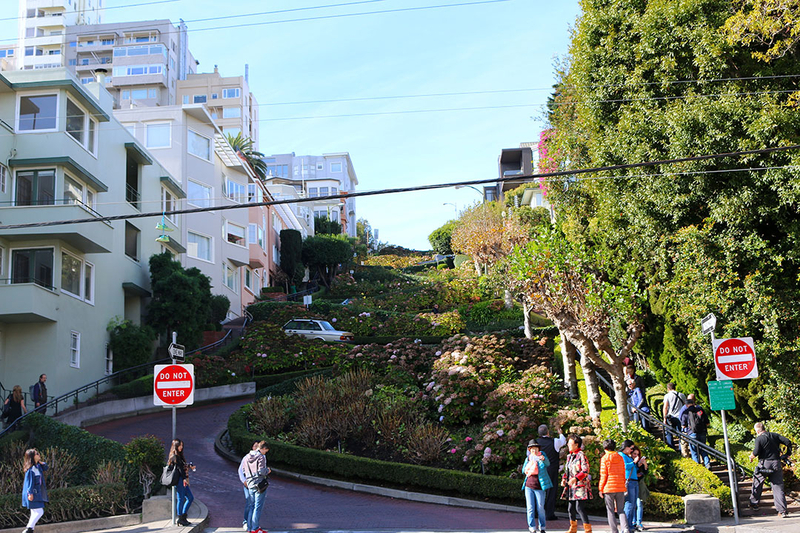 Next up was a huge walk to see the famous crooked Lombard Street with its 8 hairpin bends. Holy wow it was a hike to get there, perhaps catch the tram next time! 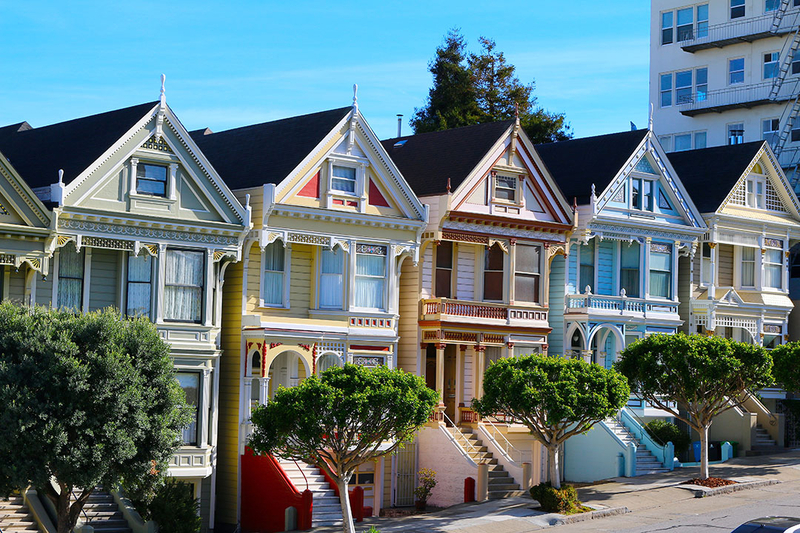 Then another big walk to see the beautiful architecture of the Painted Ladies and Mrs. Doubtfire’s house! I’m not really a big city traveller, but the architecture and colours of the buildings here is stunning. 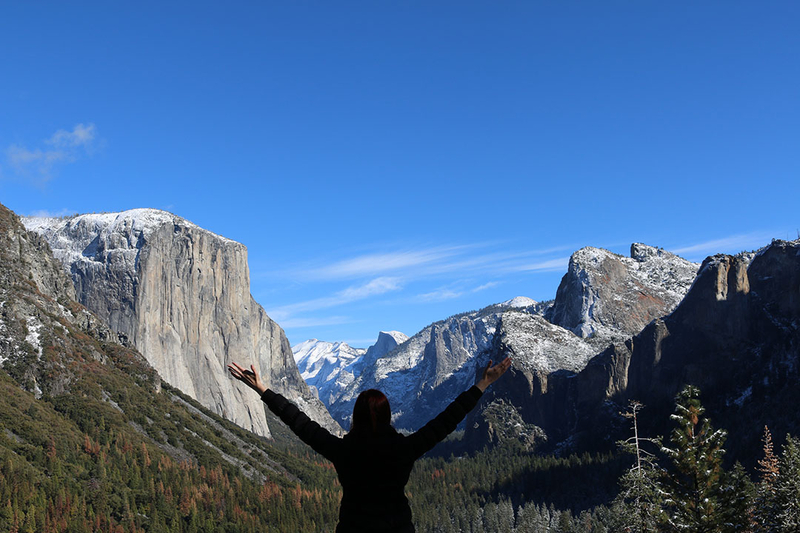 At last, it was time to head back to my natural habitat and visit the jaw-dropping Yosemite National Park! Here’s a short video, and see below for some amazing photos! 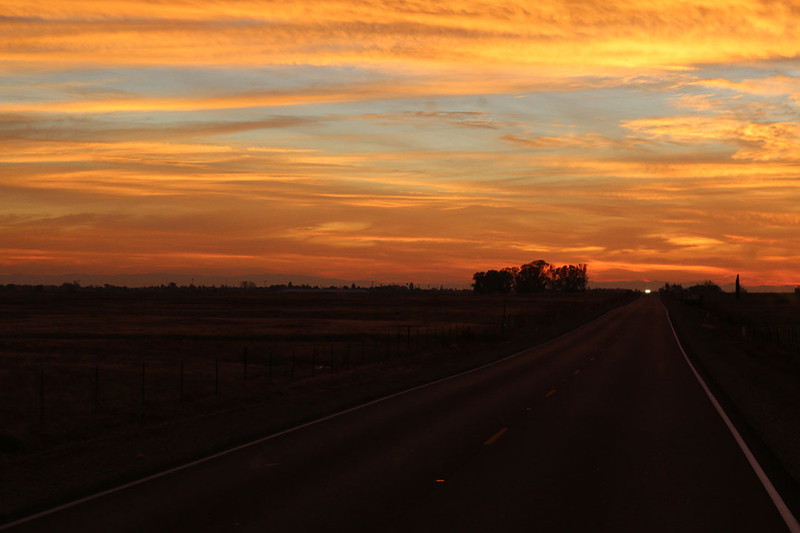 I was picked up at 6am on the tour bus with Extranomical Tours and we made a couple of stops on the way out to Yosemite, which took about 5 hours. 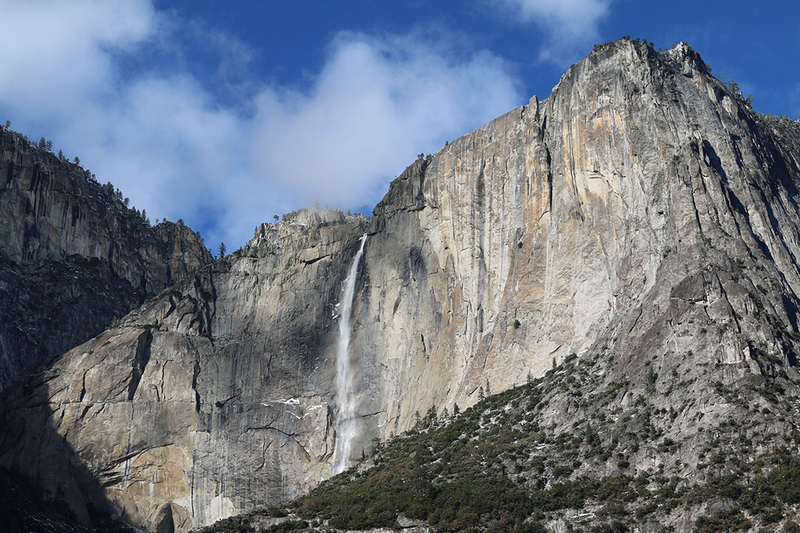 Seeing El Capitan in person for the first time was breathtaking. it literally looks like the photos! With 100% picture perfect weather at a chilly 4 degrees Celsius, the photos actually do this magnificent wonder justice. 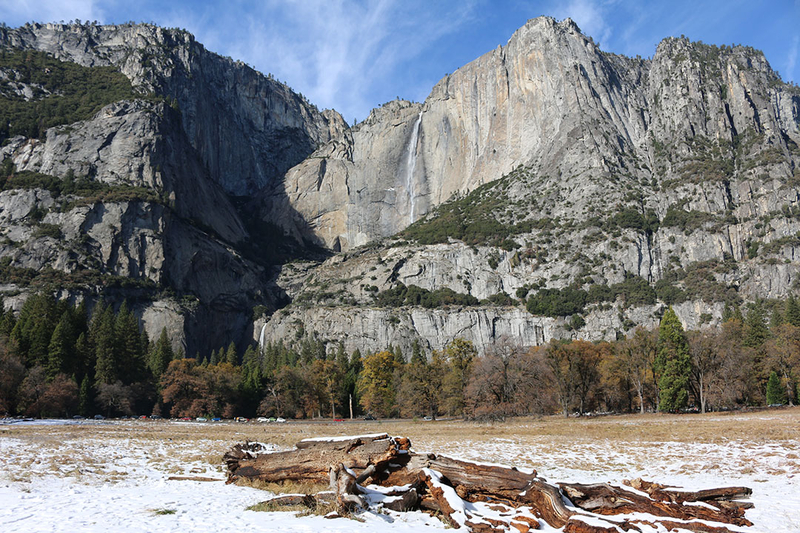 Trying to take in the enormity of Yosemite Falls is a real challenge. There is a “lower” and “upper” section of the falls, and it’s SO high, it’s hard to capture both in one photo. The photo below shows the upper falls at the centre top, and lower falls (looking deceptively tiny!) towards the bottom left. The photo below that, is of just the lower falls, with a man in a red jacket at the bottom left to show scale! By this time, the day tour had left to head back to San Francisco, however I was just getting ready for a night among the stars! I caught the free Yosemite Loop Shuttle to Curry Village, where my canvas tent-cabin awaited me. To my surprise, the heater inside was switched on… but it did basically nothing **HOT TIP: In winter, bring an epic sleeping bag! ** It got down to -5 degrees Celsius that night. Wearing everything in my suitcase and the two thin provided blankets over my face, I was still cold! 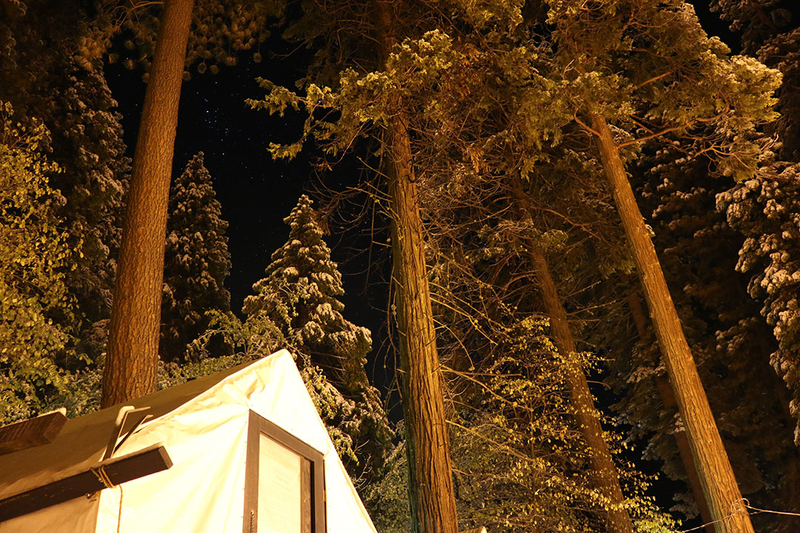 Anyway, it certainly was an experience and although it was ridiculous cold, being out in nature and having the ice from the enormous sequoia tree branches falling on the canvas tent all night was relaxing; like rain on a tin roof. 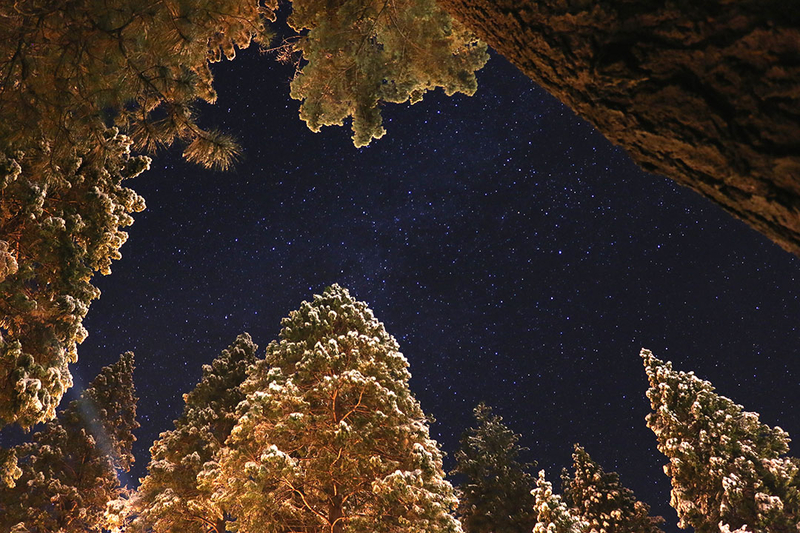 During the night I ventured outside with the coyotes, deer and (hopefully hibernating) bears to look at the stars and admire the old sequoia trees. 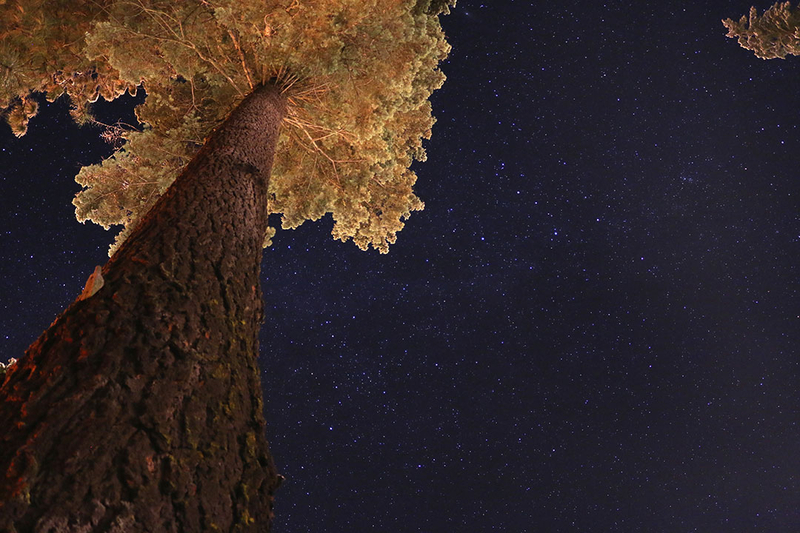 With camera in hand, of course, I snapped some of my favourite starry sky photos to date. 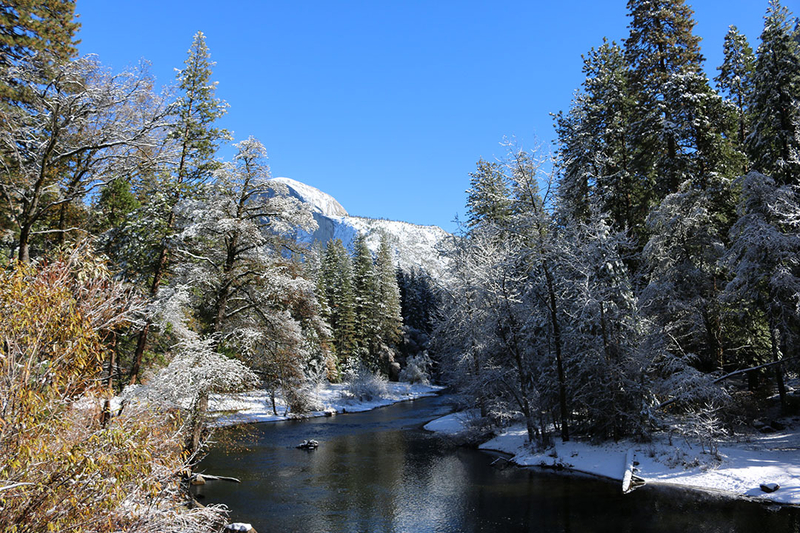 Waking up surrounded by a fresh layer of snow, a brilliant blue sky and a crisp cold breeze, I was ready to go exploring. 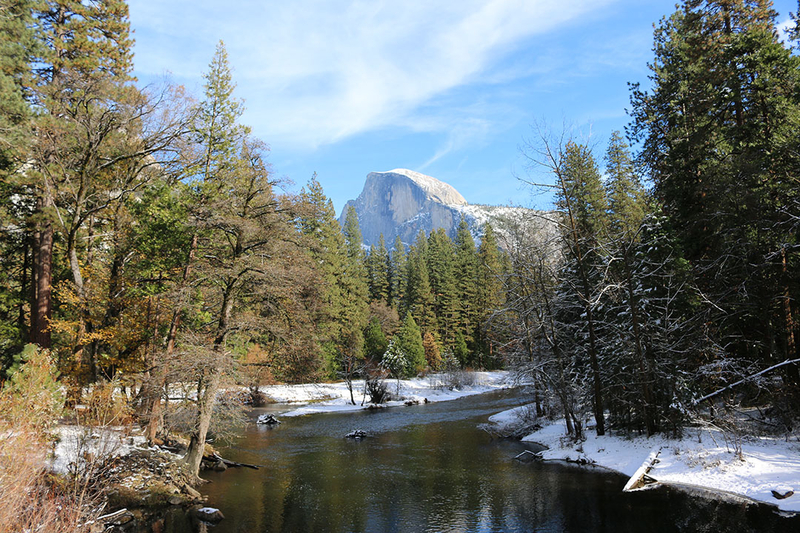 The free Yosemite Loop Shuttle runs about every 20mins in winter (more often in summer), and is the perfect way to visit scenic spots all over the National Park. I did not want to leave this beautiful place. It is so grand, and I found my eyes just could not adjust to comprehend the sheer scale of the enormous peaks surrounding me. 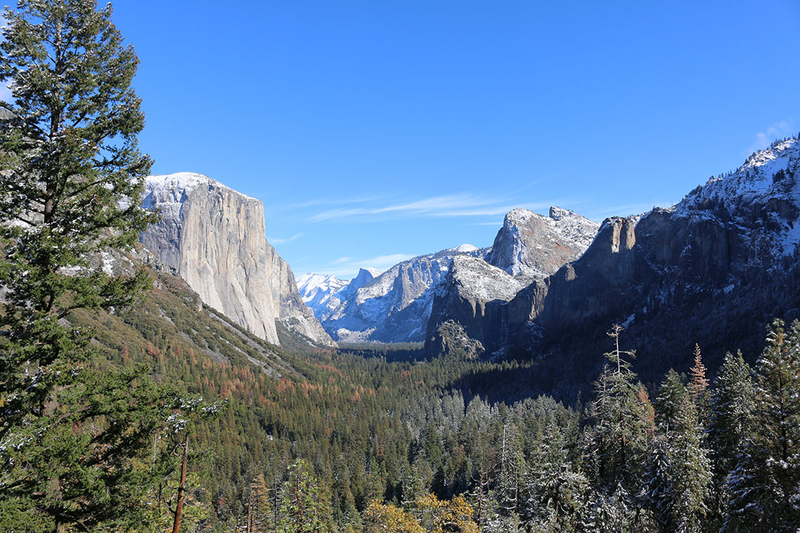 Although you can visit Yosemite National Park in a 16hr day trip from San Francisco, I would absolutely recommend staying overnight. That way you will have much more time to see the park and, my favourite, the brilliant starry skies at night due to very little light pollution. A truly amazing experience, and one I would definitely recommend to everyone! Any questions, let me know on Facebook or comment below. Love all your photos! 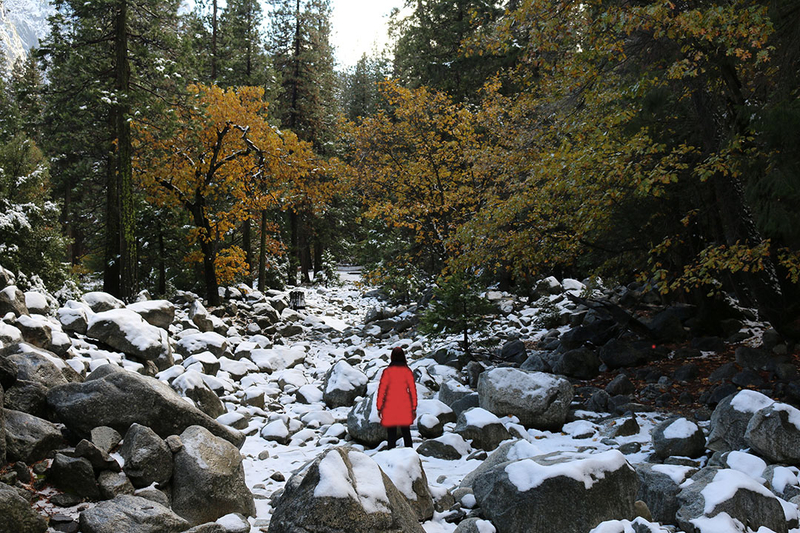 Yosemite is my new favourite place on Earth! 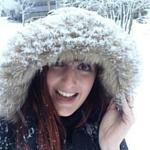 Though i would love to visit in Winter, Summer was lovely too! WOW! 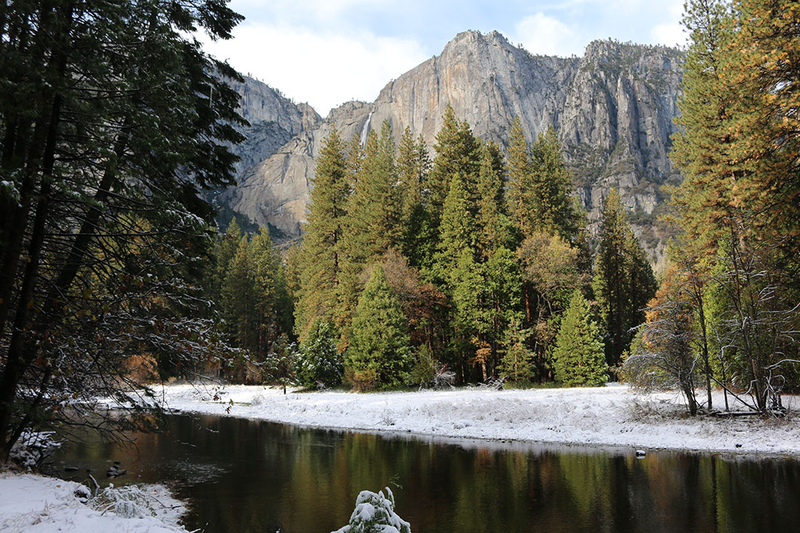 I love Yosemite. I think it is possibly the most jaw-dropping place I have ever been. It tops the USA national parks for me for views and you have captured them so well. Fantastic! On the same holiday as I saw Yosemite, I also went to Sequoia, Death Valley and the Grand Canyon (it was an awesome holiday! )…I loved them all. The trees at Sequoia were huge, the hostile environment in Death Valley is incredible and flying into the Grand Canyon by helicopter from Las Vegas gives you a real sense of how vast it is. I would like to go to Yellowstone and the Glaciers national park in Montana one day but one step at a time. There are so many amazing places to visit in America…you would need a long time to see them all.